I don’t typically write emotionally driven blog posts. That’s not really my thing and I hate that people always feel the need to compare their traumatic story to others. No story, no experience, can be compared to another’s. I am sharing this story hesitantly for two reasons. First, I need to talk about it. Keeping my emotions bottled up are stressing me out more than anything. Second, my general audience here is women in the child-bearing stage of their life. If this story can help one of them, or give them a place to feel like they aren’t alone, then this post is worth it. Last week my husband and I announced to our friends and family that we are expecting baby #4. Originally, our plan was to wait to tell anyone. I knew that being #4, I wouldn’t be able to hide it for long.. But we were thinking at least until we hit the second trimester. Those plans were altered two weeks ago when we had a scary episode related to the pregnancy. We awoke from sleep on a Friday night to what we were sure could only be a sign if miscarriage. I was told to spend that weekend in bed. We had to cancel on family events, and do so without a reason as no one knew at that point that we were expecting. That Monday I saw my doctor and a gorgeous beating heart. The relief I felt in that moment cannot even be put into words. I knew then that we should tell people. Fast forward to this weekend. This time a Thursday evening. We had a repeat of that dreaded weekend two weeks prior. I was thankful that my doctor was the on-call. She has a way of making stressful situations much less stressful, and she genuinely cares about me. I was told to sleep and make an appointment to go in first thing in the morning. Once again, I feared the worst. My “sleep” turned into staring blankly at the walls.. praying more than I’ve ever prayed. I walked into the clinic and chatted with the receptionist. My doctor was off that day, but had apparently been calling all morning to make sure I got in and all was well. He got the machine turned back on and once again focused on the baby. Beautiful heart beat. Little arms and legs waving all over. A completely healthy and closed cervix. All looked good. Then the ton of bricks. 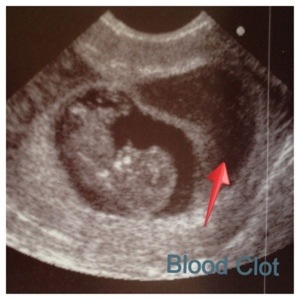 Sitting inside my uterus, above the gestational sac, was a blood clot. (A chorionic/subchorionic hematoma) Not a tiny blood clot, either. We’re talking about something nearly equal in size to the gestational sac itself. The doctor seemed surprised by the size. “Its big. I’ve seen bigger, but this is big!” This black mass is the cause of my frightening episodes and will likely cause more. To say I’m scared is an understatement. I’ve been put on modified rest. No lifting. No exercise. Nothing strenuous and no standing for extended periods of time. So far this has meant that my children get rule of the house and my poor husband gets ALL household duties in addition to his full-time job. I thought that by baby #4, pregnancy would be easy. I’d experienced gallstones. I’d had placenta previa. This, however, took me by complete surprise. The fear I have right now has reaffirmed the bond I’ve always had for my babies. Long before they’re born. I am determined to do everything in my power to eliminate this clot without it effecting my pregnancy. For now, that means I’m spending a lot of time on the couch and filling the air with prayers. Hopefully when we check it again in 2 weeks, things will be progressing in the right direction. This also means my blog will be taking a back seat to all else. I’ll post when I’m able, but I’m choosing not to fill my life with stressful deadlines right now. I hope that you understand. When this is all resolved, I promise you many new, up-and-coming baby products to be featured! I’m going need to start baby shopping soon! Thank you for your thoughts and your understanding. 14 Responses to "The unexpected.."
Thank you for sharing your story. I’m so sorry you are dealing with this right now. I’ll be praying for you, your baby and your family. Beautifully written. I’ll be praying for you, of course!!! Wow, Traci, that’s a lot to have to worry about. You’ll definitely be in my prayers! I’m praying and will continue praying for all of you! Much love gorgeous lady! First, congraulations on baby #4. What a blessing. Second, I’m going to be praying for you, the baby and the rest of the family. You will get through this. Thank you for sharing something so personal. Hugs!!!! Thank you!! Your thoughts are very appreciated!! I’ve been thinking about you a lot! I am praying right now for you and baby, Dave and the children. My heart is with you in prayer!